The latest round of back-and-forth in the endless IP battle between Apple and Samsung is over, and the former has come out on top. According to an 8-person jury in the federal court, various Samsung phones and tablets, including the Galaxy S II and III, Galaxy Note, and Galaxy Nexus, infringed on three Apple patents. The jury awarded Apple $119.6 million USD in damages. Apple didn't have it all its own way: the jury also found that none of the Samsung phones presented violated two other Apple patents, and they awarded Samsung $158,400 after finding Apple guilty of unintentionally violating one of the Korean company's patents presented in a counter-suit. The counter-claim is a penance compared to the $120 million fine, but then again, Apple was initially asking for over two billion dollars in damages for all five patents. As usual in this sort of protracted intellectual property slugfest, both parties are likely to appeal for a better deal. This is the second high-profile court battle between Samsung and Apple, and while Sammy isn't exactly smelling of roses at the end, they're faring better than last time. At the end of the August 2012 trial (also presided over by Judge Lucy Koh), Apple was awarded a staggering $1.05 billion dollars after Samsung was found to have violated design patents and trade dress on the iPad and iPhone. That amount was later adjusted to $290 million after an appeal and retrial. Unlike the 2012 trial, there is no word of a sales injunction on Samsung hardware, though all of the phones in question are so old that it might not matter in any case. Also unlike the 2012 trial, what's at stake here are software patents, not design patents, which are much more technical and somewhat different from Samsung's admittedly dramatic use of Apple-style elements in early Galaxy hardware. Just to put a little context on those dollar values: Samsung made $51.8 billion in the first quarter of this year, and Apple made $57.6 billion in the same time. Profits for the three-month period were $8.2 and $13.1 billion, respectively. The jury dinged Samsung for violating three Apple patents: 5,946,647, the "quick links" patent which facilitates tapping a phone number or email address and having it open in the dialer or email app, et cetera; 8,046,721, the infamous "slide to unlock" patent; and 8,074,172, a word suggestion typing aid patent. The jury decided that Apple patents on universal search and background data sync where not violated. Samsung was awarded its small sum based on patent 6,226,449, which facilitates compact camera and microphone modules. 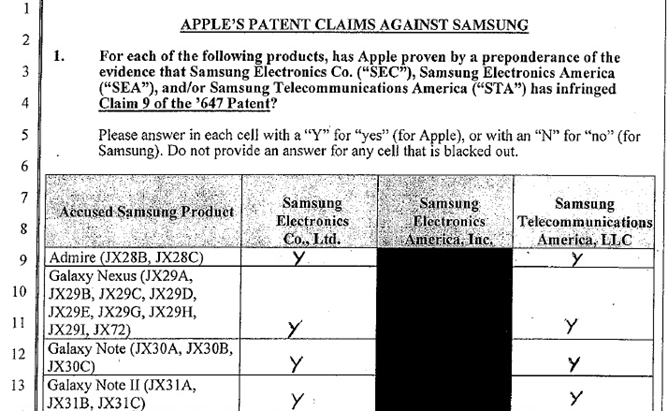 Samsung patent 5,579,239, covering cellular video transmission, was ignored. At this point, Apple and Samsung have been wrapped up in patent and trademark claims in various nations for over three years, and have been in nearly constant legal battle ever since. Apple has generally come out on top, especially in the two United States cases mentioned above. It's unlikely that there will be a break in the battle, or in the generally litigious nature of the consumer electronics market as a whole, any time soon. [Weekend Poll] Would Android Silver Replacing The Nexus Program Be A Good Thing Or A Bad Thing?